EVIL DEAD 2 – Was dead by dawn, but may yet live? Kickstarter can be a risky place and sometimes campaigns fail and, worse still, occasionally campaigns succeed in raising large sums of money, but the projects are mishandled. The latter was the case with Evil Dead 2. After raising a staggering amount of money, the project and the funds were managed so badly by Space Goat Productions that it has destroyed their established comic book publishing business. silence from Space Goats CEO Shon Bury, Jasco Games, makers of of Buffy the Board Game, have stepped up to reanimate this festering corpse to make it one we may not want to run away from! 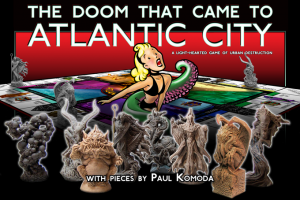 Something similar has happened before with the Doom that came Atlantic City team squandering the funds they raised in an aborted attempt to set-up a board game company, rather than focusing on creating the promised product. 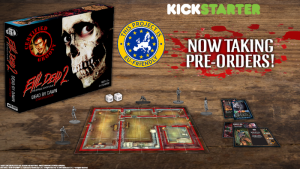 In that case where even the designer couldn’t obtain the rights to his creation, Cryptozoic eventually took over production and, although they received none of the funding, altruistically gifted copies to all the original backers. What’s different this time is Jasco don’t have access to the full planned ED2 game, that is still locked in the fruit cellar with Henrietta presumably. 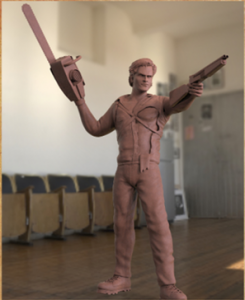 However, but do have access some of the assets – the models have already been sculpted and many have been cast created, for instance. Most importantly the licence holders have approved the likenesses. If you read Jasco’s news release you’ll see that their plan aims to raise new funds to develop their own game using these assets from the previous game, and some of them look really good to be fair, and for each copy made for a new backer they will create one for a backer of the previous campaign. As one of the backers I’m now in a quandary. If Jasco’s campaign is successful I will receive a copy…. however, do I need to back it to make it succeed? The fear is that the vast majority of people who want an ED2 game were backers last time and it’s been two years of pain to get to this point. Will there be enough willing to go for a second dip combined with enough new blood to make this work? Only time will tell. Whatever happens Jasco Games and Lynnvander Studios certainly deserve a lot of credit for trying to make this situation better for all and they will certainly be wanting you to … Join us… Join us…. join ussssss.